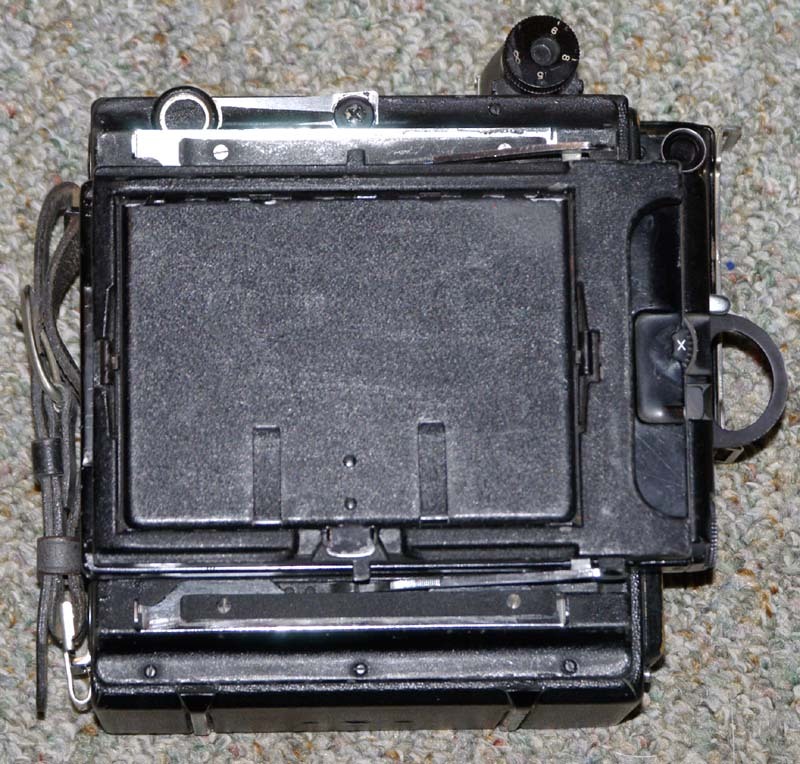 The Graflok back was introduced around 1950, replacing the Graflex back and Spring backs that had been fitted to the Speed Graphic and Crown Graphics. 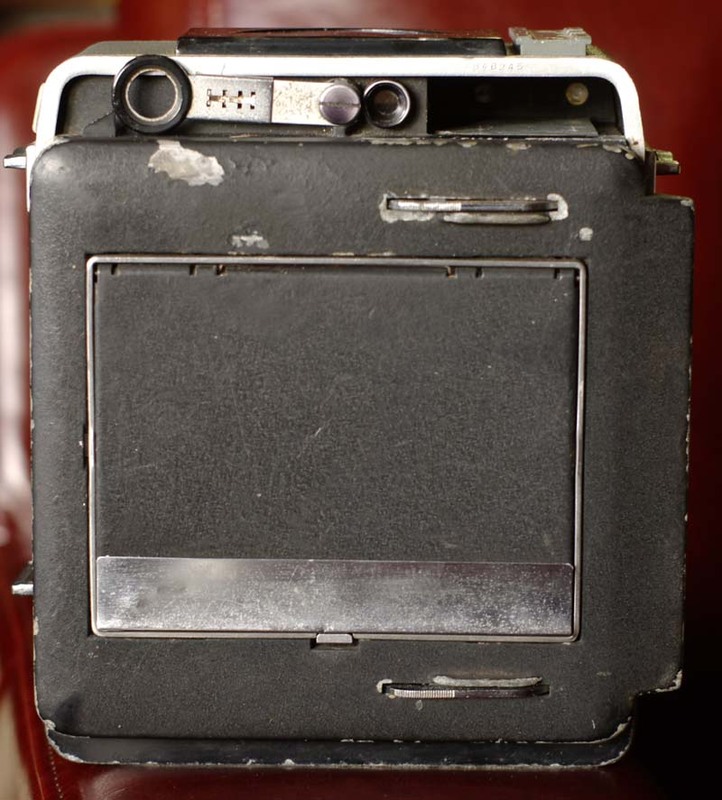 The Graflok back was an evolution of the sliding bar system of the Graflex back that allowed bulky bag mags and roll film holders to be attached. Ingeniously it also incorporated a spring back with a ground glass focussing panel and pop out hood. While the Grafmatic has the grooves that allow it to be attached via the Graflok’s sliding bars it is just thin enough to slip under the spring back. The photo above shows the basic difference between the two types of back. The Graflok back has two sliding bars, one on either side of the back (the chromed metal bars). 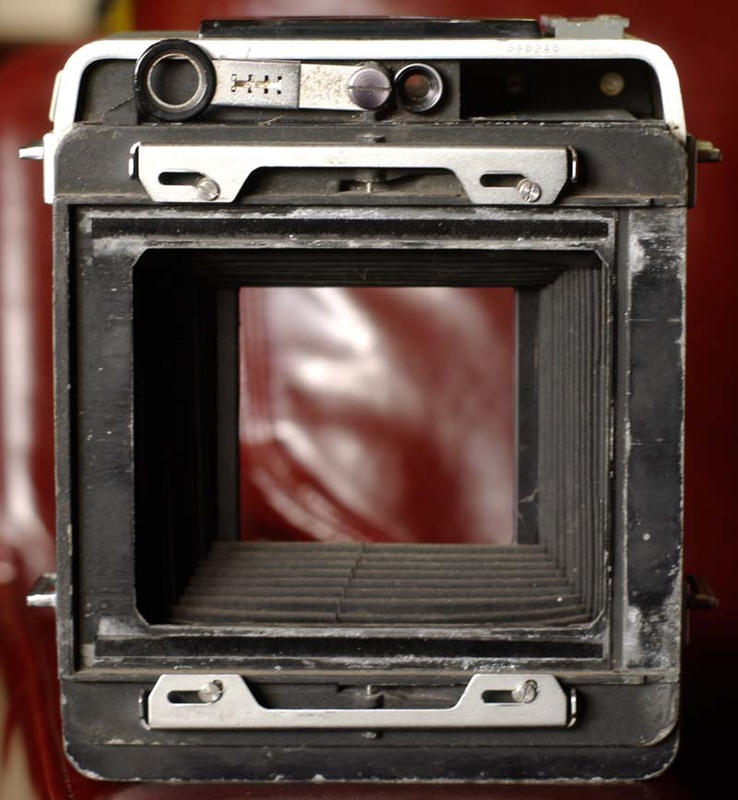 The Graflex back has one fixed bar and one sliding bar. In the picture above the top brass bar is the sliding one and the bottom one is fixed. As this is a rotating back that depends of course on the orientation of the back. Speed Graphic with Grafmatic held under the spring back. The Graflok slides aren’t actually doing anything in the picture above, the Grafmatic is held in place entirely by the spring back. This is very convenient as you can still check focus on the ground glass and then quickly slip a film holder or Grafmatic in place without the need to remove the ground glass first. If you need to use a more bulky accessory like a roll film back or even a digital back then the spring back part can be removed and the graflok slides used to secure the accessory. The Super Graphic and Super Speed Graphic were the final versions of the venerable Speed/Crown Graphic line. The spring back now covered the entire back so that the Graflok sliders are not normally visible. In the picture above the spring back has been unclipped to reveal the Graflok sliders which are an integral part of the camera. The sliders are basically the same as on the Speed Graphic except that the metal is folded for extra strength. I have seen a few Super Graphics (including my own) advertised as “incomplete – missing back” when the spring back was missing. While this is true, because the Graflok sliders are still there the camera is still perfectly usable if the rangefinder is still working. 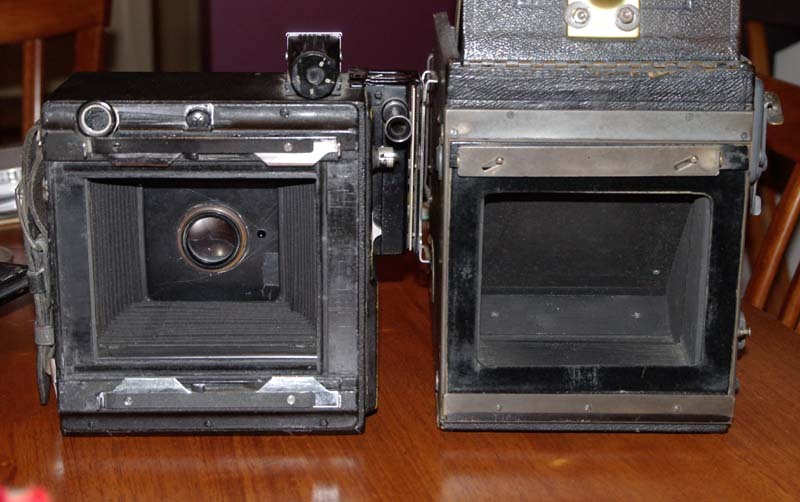 It is also quite feasible to make a slip in focussing panel, similar to the ones that the RB Graflex SLRs used. I have a 4 by 5 speed graphic. I accidentally broke the back of the camera. The arms, (hinges) used to hold the back where you put the film in aren’t attached any more. I was wondering if you could tell me how to re attach the arms. It doesn’t appear like there’s a logical place for them to lock into place. I can place them where they are supposed to be. But they don’t stay in place. Is there something that I’m missing to hold them together? To follow up for added description it’s the spring back that I’m trying to reattach to the camera. In Graflex terminology the spring back is different to both the Graflok and Graflex backs shown. The springs are screwed directly to the back and aren’t removable. The attachment point is in the centre of the spring, so roughly at 12 o’clock and 6 o’clock. If your back looks like the Graflok back and has two chrome arms with notches close to the ends then it just needs to be clicked back into place. Simply put the whole panel back into place with the arms on the right hand side and the notches at the ends of the arms almost central. It should sit in a groove and be able to slide from side to side. At this point you should be able to see the catches that the ends of the arms will slide under. Just push the panel firmly to the left and you should feel it click into place. it needs to be a firm push but you shouldn’t need to force it. The notches should now be sitting under the catches and the panel should be free to swing outwards against the spring tension but not come free. If you need to remove the panel again then pushing inwards against the ends of the chrome arms will disconnect the catches and you can slide the panel free. Thank you so much for posting this info about this camera. We were finally able to fix the orientation of the back panel due to the images and info that you posted. Thanks again.